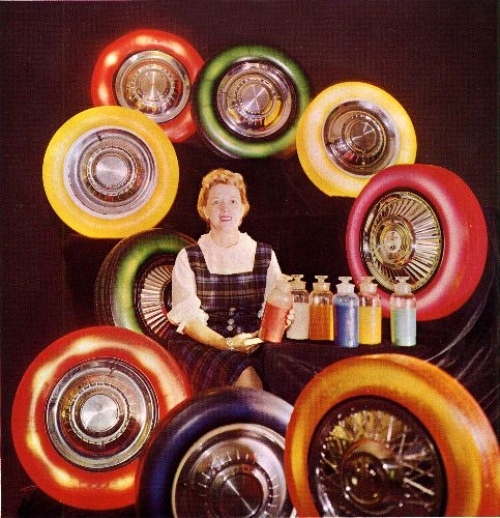 In the 1950s, car enthusiasts began playing around with illuminated tires made of translucent synthetic rubber that could be tinted any color. Goodyear soon got in the game in case it took off, which unfortunately never happened. The Chicago Tribune and LIFE both covered the tires during the R&D phase. Street tests were causing some confusion. "Other motorists have been so enthralled by the pretty colors that they have gone through red lights or just stopped to stare," Life magazine reported. That certainly was apparent when Goodyear took its show on the road. The company equipped a white Dodge Polaris convertible with red wheels and drove it around downtown Miami. Traffic halted in the streets. Pedestrians gaped in awe. Next, a red-wheeled Chrysler Silver 300 rolled through Manhattan, drawing crowds at Times Square, Rockefeller Center and the United Nations. Spectators asked the driver where to buy such tires. They were disappointed to learn that the product wouldn't be on the market "for several years." One rare time the illuminated tires were ever seen in the wild was on the Golden Sahara series, two custom hotrods with glowing gold tires, best known for appearing in the Jerry Lewis film Cinderfella. Here's a clip of that car from 1962, but the illuminated tires can't be seen under the bright lights. Researchers from Tencent Keen Security Lab have published a report detailing their successful attacks on Tesla firmware, including remote control over the steering, and an adversarial example attack on the autopilot that confuses the car into driving into the oncoming traffic lane. Since 2016, there have been multiple instances of attacks on keyless entry car-locks, and there's a burgeoning industry of expensive ($5000) aftermarket alarm systems that are billed as protecting your car from these radio attacks on its security.